Unlike traditional real estate agents, Residencity focuses on these key factors to get you the asking price you deserve and more. You will constantly be getting updates about your home and listing. For starters when you are looking to buy a car, you are able to test drive the car before you commit to making an offer. When you are buying a home, you make an offer first, then check to see if there is anything wrong. This is backwards to us and Residencity has come up with solutions. Residencity is a modern real estate service focused exclusively on selling your home with services that are designed to maximize your sale. All listings through Residencity include a pre-inspection. This promotes confidence for potential buyers. Each team member is equally invested in the presentation and sale of your property. 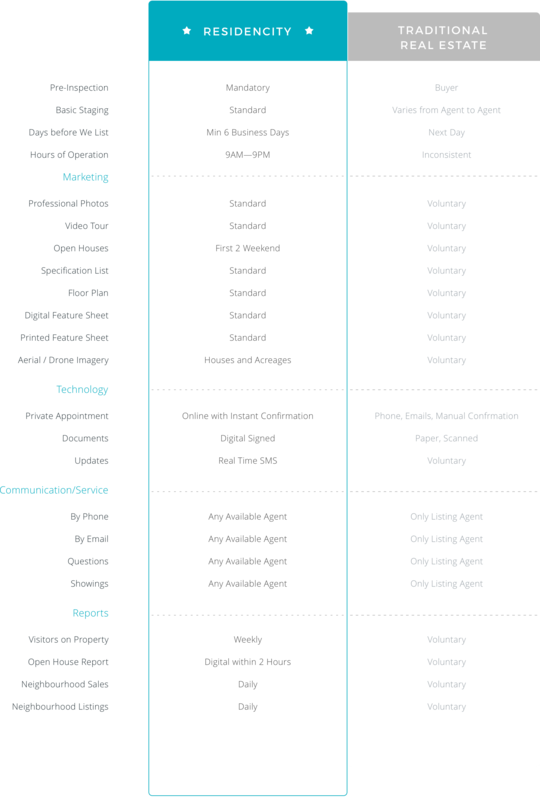 You can book open house appointments online and we guarantee a real estate agent to present your home. Residencity is breaking down traditional real estate barriers. More technology means the selling process is less work which makes for a happier you. Test us along with other real estate agents before making your decision. Don’t be scared of knowing what’s wrong with your house. The home inspection is on us and it will place us in a better spot than competing properties. Residencity brings you the best staging and photography to make your home look its best for its listing debut. Prospective buyers/agents can book private showing online or visit an open house. Residencity also guarantees an agent present for every open house and private appointment. All offers will be presented to you and we will work with you through the steps of negotiation. This is the final step in the sale of your home and where you get the money. Happy Selling with Residencity. Schedule a meeting with one of our experts to see how Residencity can sell your home.